Hi, this is John with the Kili Crew, it’s about a quarter till six or so. We’re sitting in camp here at Karanga Camp, enjoying a nice afternoon sun, some clouds up on the mountain, but all in all a beautiful day. 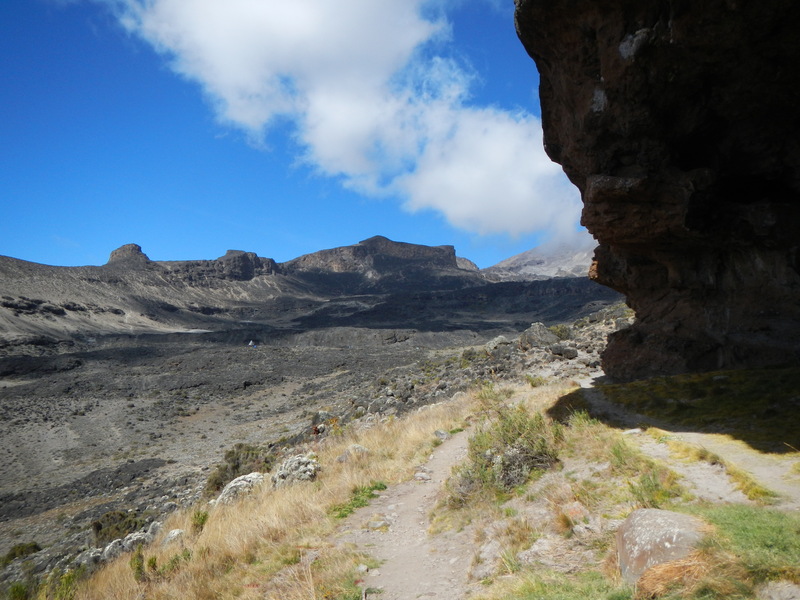 Today’s climb was up and over the Barranco Wall which in general everybody enjoys; it’s a little bit of a different day than the rest of the days on the climb. Involves a little bit of scrambling using your hands a little bit for some balance in a couple of spots, nothing too scary but quite fun. There’s sort of a ledge that traverses a little bit steeper section, but that ledge permits everybody to get up and over that Barranco Wall without too much exposure or hassle. Today’s meant to be a little bit of a short day, so that we come into camp early, have lunch and camp actually today, instead of on-the-road and then enjoy the rest of the day sort of relaxing and loading up a little bit for our push to High Camp tomorrow. Everybody seems to be doing well. Everybody’s healthy and I hear some folks in the dining tent laughing, and going in there are some folks who are in there reading a few books, everything from a book on making movies to a book on climbing Kilimanjaro. We’re headed up to our High Camp tomorrow. We usually spend most of the morning getting there and pull into High Camp sometime in the early afternoon. So everything’s looking good so far for us. And we send our greetings to everybody back home.